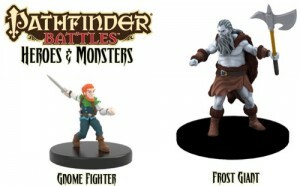 Paizo  and WizKids  announced the Pathfinder Battles pre-painted miniature line yesterday,  just a few days before GenCon 2011, so I expect they will have samples at their booth (see interactive GenCon exhibit hall map ). This announcement comes practically on the heels of their first foray, the Pathfinder Beginner Box Heroes  4 mini set. The first set, Heroes and Monsters, includes 40 figures and will debut in December with the second 60 figure set to follow June, 2012 called Rise of the Runelords. No doubt we can expect some sort of collected hardcover anniversary edition of the Adventure Path of the same name. The good news is pre-painted miniatures are back (after D&D minis’ slow decline) and the promotional images make the sculpts and paint job look pretty good. The bad news is that they are random and expensive. Also, the look & feel of the minis is just a bit too stylized [anime] for my tastes. $3.99 for a single, random mini with a medium base (or two small based miniatures). I think those prices are exorbitant for a single sight-unseen, random miniature. A standard Pathfinder mini from Reaper usually costs around $5.99. Yes, I may have to paint it, but I know what I’m getting. Random is synonymous with Collectable in this instance, and I’m not a fan of catering to the collector or speculative markets. It is standard practice in those markets to make things rare so people buy mass quantities of your product just to obtain key pieces… which are in turn sold on the second hand market for even steeper prices. 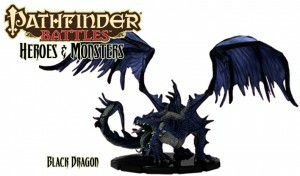 Case in point, the huge black dragon miniature offered through Pathfinder Battles. According to the press release, it can only be obtained through retailers who have purchased at least a case of minis. I can just imagine what unscrupulous retailers might do on eBay with these. Well, I guess it’s helping out brick & mortar shops; they need all the help they can get to survive. Another factor to think about is the brick-and-mortar retailer. It’s much easier for a retailer to stock single booster packs than individual packaged minis. Paizo has earned a reputation with me for producing quality material and backing that up with exceptional customer service and fan support. They obviously are successful because they make good business decisions while I’m just vocal consumer with no experience with miniature manufacturing. Even so, WizKid’s business model seems to take advantage of the collector syndrome, which I’m not a fan of exploiting. 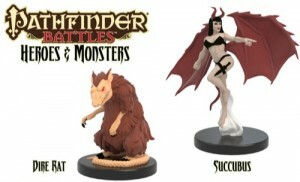 My strategy would have been to release themed sets, much like the Pathfinder Beginner Box Heroes and like D&D tried to do but with better quality. I’d love to see a set of 10 or 20 figures for each Adventure Path or sets for PCs when major supplements like the Advance Player’s Guide are published. Then you can still produce those misfit minis that are needed, but not popular, because you’re not selling them singly. The press release does state that Encounter Packs of visible non-random re-sculpts/re-paints from the parent sets will be available, but I wonder if it will be enough to satisfy me.